This year’s event is positioned to be even bigger and better than the previous three years with the addition of a National Headliner Act provided by The Casino at Dania Beach: Survivor. Perks include invitation to the DBASC pre-event volunteer social, at Frost Park on March 24, a one-of-a-kind Dania Beach Arts and Seafood Celebration Fourth Annual souvenir T-shirt and daily refreshments at the event. To volunteer your time and be involved in our community, RSVP for the March 24 “Kick-Off Party” which will be held at 6 p.m. at the Frost Park Recreation Center located at 300 NE 2nd Street by emailing Kisha Payen at kpayen@ci.dania-beach.fl.us or by calling 954-924-6801. Complimentary refreshments and snacks will be provided by Jimbo’s Sandbar and volunteers can collect their souvenir shirt. Please visit http://daniabeachartsandseafoodcelebration.com/ for more information about this event. 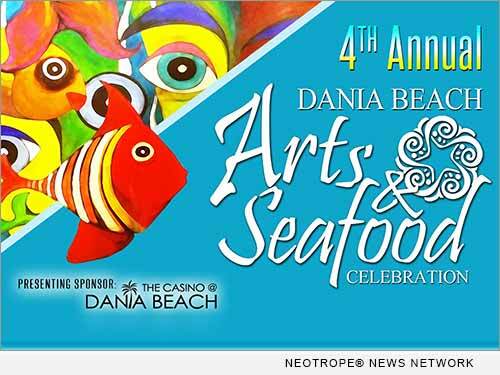 The Dania Beach Community Redevelopment Agency proudly presents the award winning fourth annual Arts and Seafood Celebration on Saturday, April 2, 2016 from 11 a.m. – 8 p.m. and Sunday, April 3, 2016 from 11 a.m. to 7 p.m. Experience two days of fun and excitement featuring fresh mouth-watering seafood, great live music, various culinary delights from top local restaurants, fine arts and crafts, local retailer booths, magnificent sand sculptures, family activities and much more. The main stage will come alive with a dazzling line-up of entertainers in a variety of scheduled performances featuring Survivor and their rock anthem hit “Eye of the Tiger.” The Dania Kids Beach Party Fun Ville has activities for all ages, with something for everyone in the family to enjoy.